The TV screen is our main window from here we can see the emulation output on the TV and access all of the settings via the 'Menu' Button. For quick loading of tapes or disks you can drag and drop the .dsk, .tzx, .wav etc. 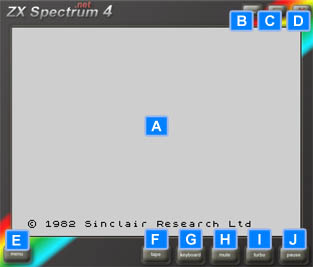 on to the TV screen this automatically set the ZX Spectrum up into the LOAD "" and play the media.